Race Fireman Sam to the emergency! On our family holiday to Butlins earlier this year we were fortunate to watch a Fireman Sam show. From watching that one show it has ignited Tigger’s passion for all things Fireman Sam. You can often find him singing ‘Extra, extra, read all about it, Sam’s our hero, no doubt about it!‘. 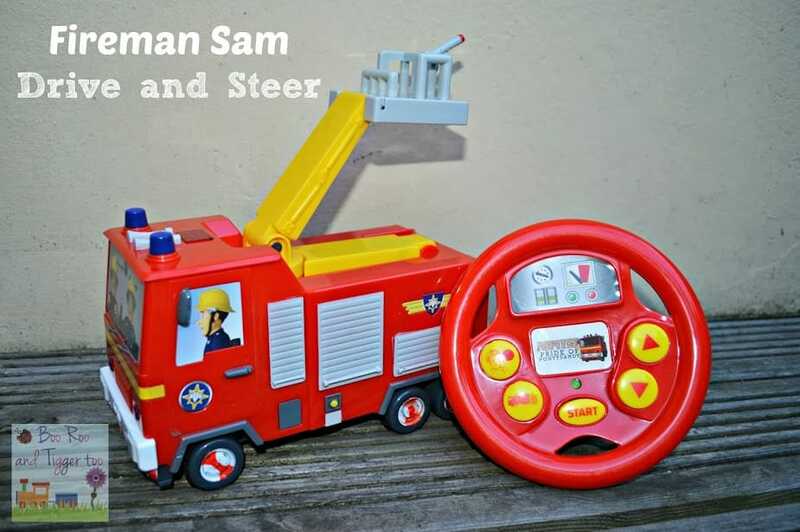 So when I was offered the opportunity to review the new Fireman Sam Drive & Steer Jupiter I jumped at the chance. 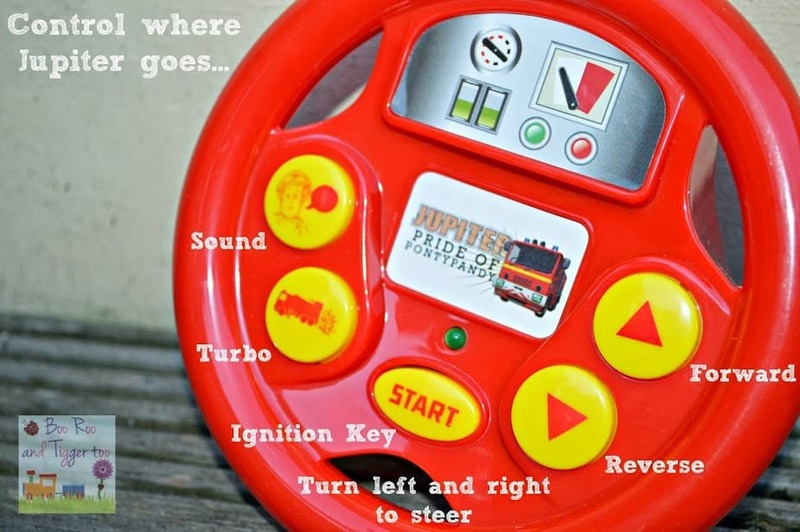 The drive and steer Jupiter is aimed at children aged 18 months+, teaching them hand-eye co-ordination, cause & effect and spatial awareness with a RRP of £29.99. Opening the parcel Tigger eagerly spotted the Fireman Sam logo on the side of the box and started dancing around the living room. As I unpackaged Jupiter I immediately got frustrated, not only is the toy tied to the packaging with string but it is screwed, yes screwed to the cardboard base. Cue the hunt for a screwdriver to release Jupiter from the grips of its packaging. Pride of Pontypandy fire service, Jupiter is always on hand to attend all manner of disasters. Expertly driven by Sam, and with Elvis on board, Jupiter is a welcome sight to anyone in trouble. Always clean and shiny. Jupiter’s bright red and yellow paintwork flying by are a clear sign that help is on the way! With Jupiter finally free from the packaging I handed it over to play with whilst I went in search of some batteries, I quick look at the packaging I suddenly realised that I would indeed need 8 AA batteries! 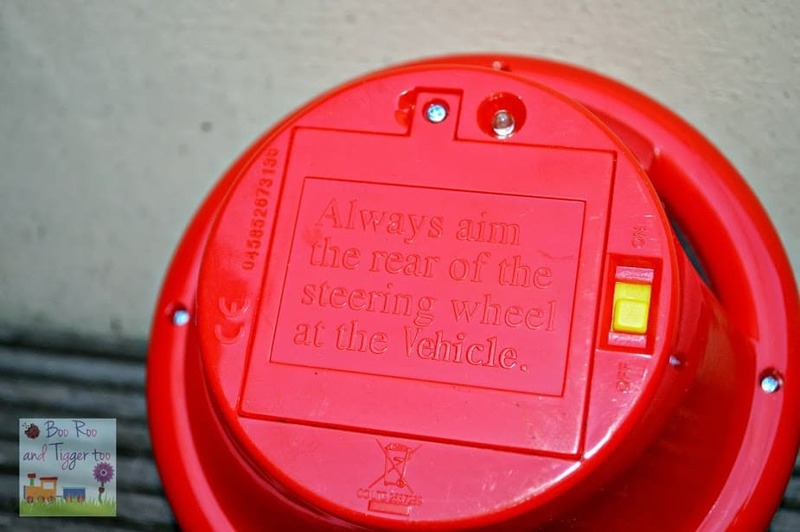 Four batteries are required in both the Jupiter and it’s steering wheel, not necessarily cost effective however by using rechargeable batteries this cost can be eased somewhat. Batteries loaded and we are ready to go! the chunky steering wheel is a good size for little hands and looks and feels robust enough to withstand a few drops and knocks. The five buttons are large, bright and easy to press. Tigger easily got to grips with the button pressing, understanding the turning the wheel left to right to steer Jupiter was a little more challenging. Although I have to say he actually thought it was really good fun crashing into the furniture, toys and best of all… Mummy’s feet! The sound effects make the Jupiter come alive and encourages the child to learn and repeat the phases. There is a mute button underneath Jupiter so if you are craving a little peace and quiet, simply flick the switch and let your little one whizz away without Fireman Sam’s voice interrupting your five minutes peace. Tigger was obviously very excited to see Jupiter and even more so when he realised that he was able to make it move. His driving skills are getting better however I am thankful that it is a number of years before he is allowed behind the wheel of a car. Overall I liked the Jupiter, the chunky steering wheel really does make it more child friendly and easy to use. I am disappointed to see that it takes 8 AA batteries, even with rechargeable batteries reducing the cost of replacement it is a lot of batteries. I do love the mute function, clearly whoever thought of that functionality has children! 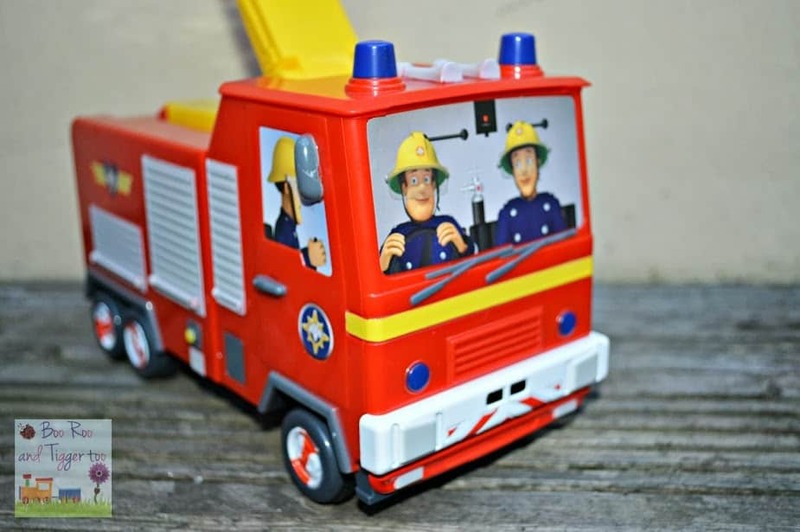 Disclosure Policy: We received a Fireman Sam Drive & Steer Jupiter FOC for the purpose of review.